I made this drawing just for fun during my lunch break. Most dogmen doesn't recommend the use of door springs or whatever spring it might be. Yes spring may injure the dog the it snaps and hits the dog like a whip. Bungy jumping ropes are more safe...yes, but where do I buy them. Also a tree branch can be used as a spring, it will surely pull back tag with the dog. The safety rope indicated above will do the job of holding the springs in case it snaps. 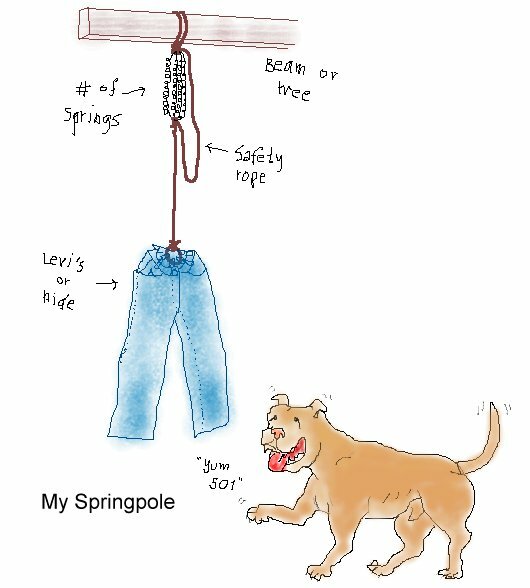 Btw...make sure that the dog's feet are on the ground when playing with the springpole, just adjust the height o.k. also attach whatever you like on the end of the rope.